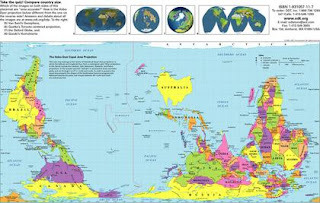 We don't offer them yet, but they are excellent examples of learning aides that disabuse you of certain assumptions that can hinder your thinking: upside down maps and globes. Upside-down maps weren't always seen as upside-down. Maps haven't always placed the north on top. The orientation depended on the bias of the people who made the maps. For example, in the Near East, there are clues that ancient directional orientations placed the east on top. In the Bible, Abraham and his men are mentioned to have rescued his nephew, Lot, in "Hobah, which is on the left hand of Damascus" (Genesis 14:15, KJV). In modern maps, Hobah (modern day Choba) is northwest of Damascus. Since Damascus has the distinction of being one of the longest continuously inhabited cities in the world, if Hobah also didn't change location, then it's probable that people looked to the east as the top of the land. Ancient Arabs were thought to put south on top because, when you faced the rising sun, south was to your right and since the right side was viewed positively, they put the south on top of their maps. 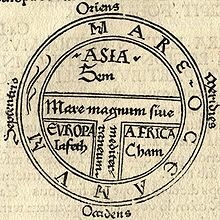 Later, maps of early Christians followed the 'east is top' tradition with the Orbis Terrarum map, placing Jerusalem at the center and east on top, because paradise was said to be east of Jerusalem. East was called Oriens. This is the source of our term 'to orient'. Read more of the fascinating directional preferences of other cultures here. One thing is constant though: people regard the top as positive and bottom as negative – with negative consequences, unintended or not, for those who were placed in the negatively perceived direction. The still-existing divide between North and South, East and West is a remnant of those consequences today. Modern upside-down maps and globes. Answer, nowhere. Since the earth is spherical, there's no law carved in stone that North should always be up, because the only way up in a globe is outwards; down is inwards. Looking at something from another perspective is a hallmark of creativity. Looking objectively at differently-oriented globes (or people) promotes creative thinking and the understanding that other viewpoints can be perfectly valid and correct. Directional biases make us view the world through a visual straight-jacket. We can free ourselves from our biases by seeing the world through fresh eyes, different perspectives, different directions. 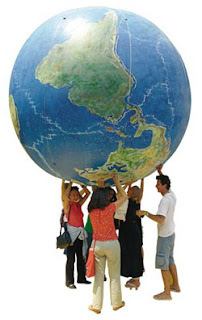 We're not advocating a total change in map or globe directions. We're only pointing out that, by seeing the world differently, and by acknowledging that no cardinal direction is inherently superior, we can avoid feeling smug and see other people as downtrodden by being "down under."